SAN FRANCISCO (CN) — With national debate sometimes turning violent over how to deal with statues seen as symbols of oppression, San Francisco on Monday took its first step toward removing a monument that some say glorifies the conquest of Native Americans. 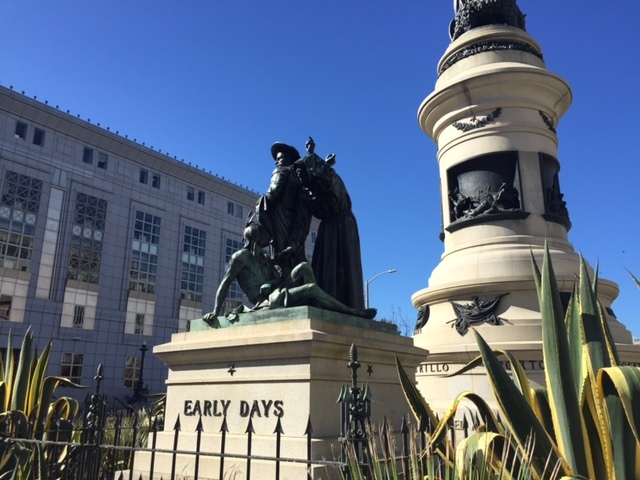 The San Francisco Arts Commission voted unanimously Monday to begin taking down one section of the 123-year-old, 820-ton Pioneer monument that depicts two Spaniards standing over a shirtless Native American, a piece many critics have denounced as a symbol of white supremacy. “How would you feel if someone came in your home, killed your family, and put a statue commemorating the people that killed and enslaved your people?” San Francisco artist Malaika Clarke said in tearful and emotional testimony to the commission. A renewed push to get rid of the monument surfaced in August when activists started a Facebook group and online petition demanding its removal. The structure is sited prominently between the public library and Asian Art Museum in the city’s Civic Center district. The monument was dedicated to the city in 1894 and survived the great earthquake of 1906, while the City Hall building was destroyed. In the early 1990s, the statue was moved to its present location and a plaque was added to provide context, but many complain that plaque is barely visible due to overgrown grass. While the quest to take down the statue received broad support at the Monday meeting, not everyone was on board with its removal. San Francisco resident Reid Stuart asked whether it’s “actually bad” to display artwork that portrays a bygone way of viewing the world. He said the creators of the “Early Days” section of the monument probably thought it depicted a Spanish priest helping the seated native. But Stuart found few allies at the meeting. Only three of the nearly two dozen speakers urged the commission to preserve the statue. Arts Commissioner Marcus Shelby rejected arguments that the statue should remain in place in the interest of historic preservation. “If we’re going to represent the oppressed in this city, people of color, then we have to start with bringing down these symbols of white supremacy,” Shelby said. The Arts Commission estimates it will cost $160,000 to $200,000 to remove the statue, which will require approval from the city’s Historic Preservation Commission. The Pioneer monument is not the only controversial symbol targeted by activists in San Francisco. Some have called for removing a Christopher Columbus statue in North Beach and a statue of Junípero Serra, founder of Mission Dolores, because both figures are seen as contributing to the oppression and conquest of native people. The San Francisco Board of Commissioners is considering renaming Justin Herman Plaza in front of the city’s iconic Ferry Building. Herman, who headed the city’s redevelopment agency from 1959 to 1971, has been criticized for displacing more than 4,000 people from the Fillmore District and destroying hundreds of homes to make way for redevelopment projects.